Rupert Murdoch is sending a signal that his new co-presidents of Fox News will be staying in place well past the November election. Bill Shine and Jack Abernethy have both signed "new multi-year contracts," presumably with raises attached, Murdoch announced Wednesday. He said the new contracts "ensur[e] stability and leadership to help guide the network for years to come." Fox did not indicate the exact end date of the contracts. In July the conservative cable news network's founding CEO and chairman, Roger Ailes, resigned under pressure amid an investigation into an alleged pattern of sexual harassment. Ailes has denied the allegations. Ailes' swift exit created a leadership vacuum. 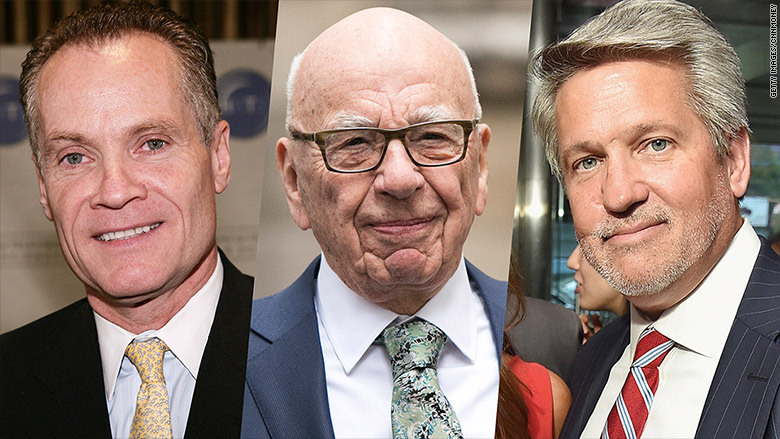 21st Century Fox (FOX) then moved to name Shine and Abernethy co-presidents, both reporting to Rupert Murdoch, the executive chairman of the company. His sons Lachlan and James run the company in concert with him. When their promotions were announced in August, there was immediate speculation in media circles that these were interim appointments -- band-aids that would get Fox News through the all-important presidential election. After the election, some observers believed, the Murdochs would make long-term decisions about the channel's executive leadership. But Wednesday's announcements counter that perception. Abernethy, the longtime head of Fox's Television Stations division, now also runs the business operations of Fox News. Shine, previously the senior executive vice president in charge of programming, had been one of Ailes' top lieutenants, overseeing the channel's top-rated opinion shows. He is now in charge of all news coverage and opinion programming. Shine is well-regarded among many Fox hosts and correspondents. Sources previously said he was the most logical successor to Ailes. But because of his status as a right-hand-man to Ailes, there has also been talk that Shine may have known about Ailes' alleged behavior. Ex-host Fox Andrea Tantaros recently asserted in a lawsuit that she informed Shine of sexual harassment by Ailes last year, and that Shine did not take proper action. Shine has denied the allegation, and Fox News has dismissed the overall suit by calling Tantaros an "opportunist." The company has struck settlement deals with several other women who alleged harassment, including Gretchen Carlson, whose July lawsuit triggered the investigation. Both Shine and Abernethy are also co-presidents of the smaller spinoff channel Fox Business.